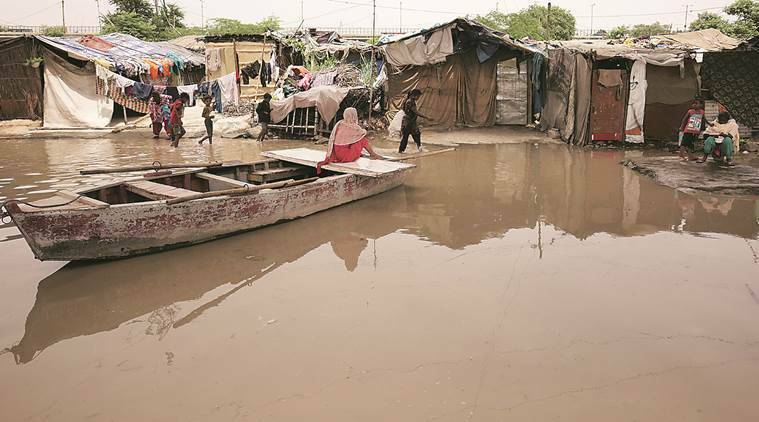 Anticipating that the water may surround some localities, over three dozen families from Dhani Asadpur in the area were shifted to safer places. In Yamunanagar, more than 30 villages were put on alert following rise in water level. For the third day in a row, the Yamuna’s water level remained above the danger mark — touching 205.82 metres. Evacuation efforts continued even as the water level at Old Loha Bridge is expected to touch 206.50 metres on Tuesday afternoon, after water released from the Hathnikund Barrage in Haryana reaches the capital. The danger level is 204.83 metres. The Yamuna passes through six Delhi districts. Rescue and relief operations are underway in these districts, with the government setting up tents and providing food to those who have been rescued from the settlements on the floodplains. On Monday morning, discharge from the Hathnikund Barrage was 37,976 cusecs. The water level had reached 205.30 metres at 7 pm on Saturday. The highest water level recorded at the bridge was 207.49 metres in 1978. It was 207.11 metres in 2010 and 207.32 metres in 2013, according to the Delhi Disaster Management Authority. The Haryana government, too, has forecast that the situation will improve in the coming days. Officials said that just 37,976 cusecs was released from the Hathnikund Barrage in Yamunanagar district at 11 am on Monday, in comparison to over six lakh cusecs on Saturday evening. Haryana Additional Chief Secretary (revenue and disaster management) Kesni Anand Arora told The Indian Express that the high level water is likely to reach Faridabad and Palwal districts on Tuesday after crossing Delhi. Haryana Revenue Minister Captain Abhimanyu said that they were even keeping an eye on the pattern of clouds to avoid any risks and make preparations in advance.